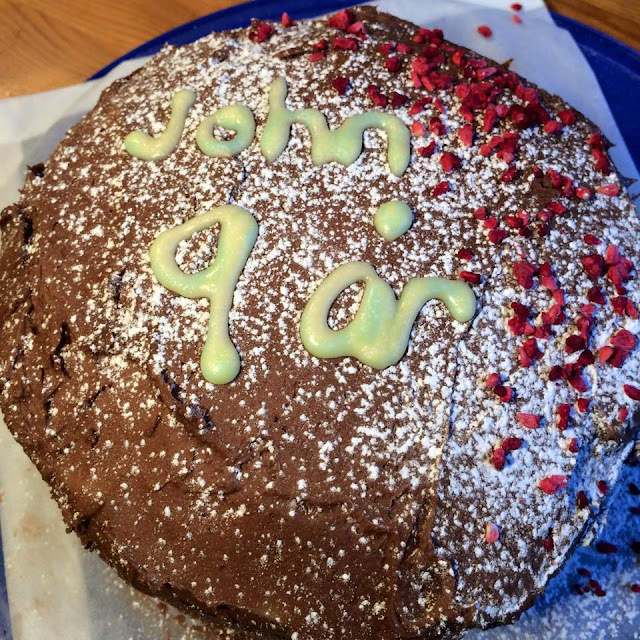 Hmmm, I am surprised I have not written about this cake, as it seems to be one of my most popular ones... weeeeeell, that's stretching it a bit. It's more a situation that this is a cake whose appearance exceeds the work required to create it, so it was the one I whipped up for a friend's barbecue. From that second attempt at the cake, I make the huge artistic leap to say that it's become somewhat of a go-to cake that I use to show that I care a little bit as it looks a bit more showy than a biscuit. I, personally, am not the biggest fan of chocolate cake. Certainly not this one, which is of the cocoa variety. 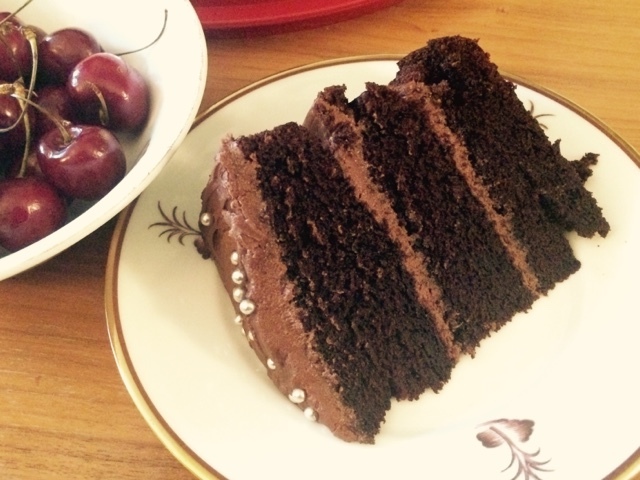 According to the preamble on the recipe, there are three types of chocolate cake: flourless, cocoa, and fudgy. The chocolate cakes that I appreciate most are of the fudgy variety. Most definitely. However, its seeming failings aside, this cake is actually quite good. I am very wary of layer cakes as I fear they will not be moist, and knowing the drying effect of cocoa, I was on edge the first time I made it. I made some tweaks to the recipe that are scrawled somewhere on my paper copy, and going against my general rule of following a recipe exactly once, I just went with my gut. I have now made this cake three times, and it has delivered each time. My first attempt was okaaaay, but I ruined it by using icing that I had too much of and was far too soupy. Not wanting to waste the icing, I used as much of I could of the moussy stuff to sandwich and surround the layers. It resulted in a chocolate milkshake-looking cake. The second attempt was perfection. Until I tried to level it. This is the second time I've attempted such a thing, and both have not gone well. When stationary the cake was a masterpiece. In transit, it slid off it Samara-crafted cake slope. Fabulous. I am considering investing in a wire cake cutter tool, however have not had confidence in the online reviews of the ones I have looked at. Suggestions anyone? Finished product, naked cake style! Eagle eyed viewers can spot my leveling attempt! 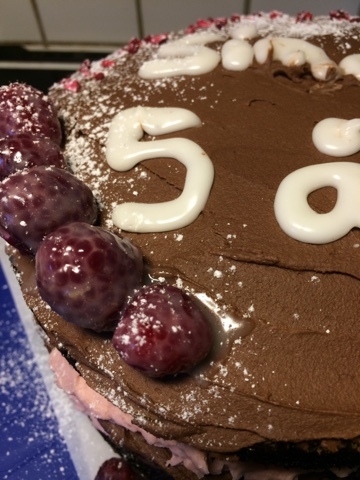 My last attempt was for my first order from my new online bakery, and was intended to be a 5th birthday cake for my colleague's son. 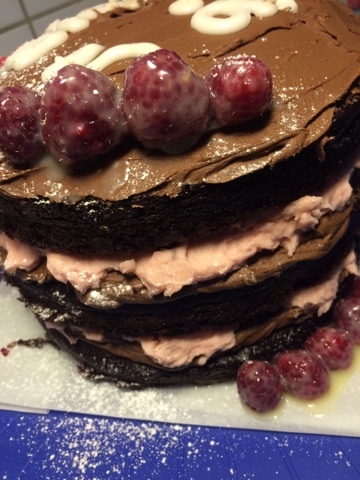 This lucky young'un has a liking for both raspberry and chocolate, so after discussions, we agreed on sandwiching the icing with both raspberry and chocolate frosting. 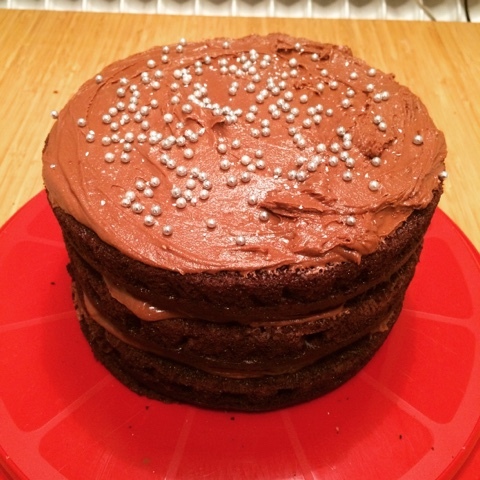 We didn't want to make it too adult/cocoa-ey, so I suggested a milk chocolate buttercream frosting. Grand idea, but ineffective. 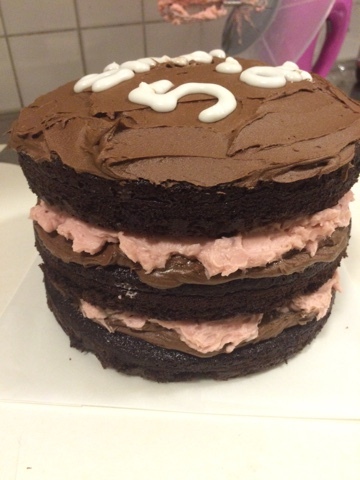 I used 150 g of precious milk chocolate chips, and it somehow got absorbed by the butter icing flavour, so I resorted to cocoa in order to obtain the cocoa taste, I managed to find some inspirations on making rasberry buttercream frosting, and concocted a rather successful batch of the stuff. So lesson learnt: real milk chocolate does not flavour buttercream icing. Now as much as I bluffly profess that I have no time for frou frou, decoration, and such like, this is more a testament of my abilities than of the visions I have in my head of what I want to create. This is one of those times that I will hide behind that proclamation. I pictured a towering masterpiece with clear and straight levels of cake and two tone icing. That is far from what the reality was. Looks like something from Ghostbusters 2! Whilst I was very confident in the cake and all the flavours, I have to admit that the final piece was a let down. You see? You see?! It was better on the test run! I made the mistake of using a ready made decorating tube or what turned out to be a thick, sticky, sugar paste, that I have never used before. And will probably never use again. My test 'piping' was passable enough that I wouldn't have minded that being on top of the actual cake. My real attempt looked like a child of the age displayed on the cake did it. I was as embarrassed to the extent that I could be (which is not much). To try to distract from the main debacle, I added some fresh raspberries covered in a white chocolate mix, which did nothing for their appearance, but did everything for the flavour, sprinkled some dried raspberry flakes and icing sugar over the top. It helped marginally, if that. I have a chance at redemption! My colleague has asked for a repeat order, with the addition of marzipan! I'm not confident on the flavour combination, but faint heart never won fair lady! Well... it was neater, however my mental images of piping a Cumberland style coil of icing for neatness didn't quite work, and I have a LOT to learn about marzipan. I'm not even convinced what I was using was marzipan. I wasted maybe half the packet. Learned it was delicate so didn't quite work with my strenous rolling, and that I should probably invest in a good size pastry rolling mat for ease of application. As the original plan was to cover the whole cake in marzipan, I filled the layers with raspberry buttercream icing only. I also decided to try and beat the cake levelling system by placing the top cake layer upside down so that its flat bottom would create a level surface for icing. Yeeeeh, that didn't quite work. The top layer decided to have a bit of a breakdown, or rather just started to break so I had to carefully flip it over and use the domed surface. 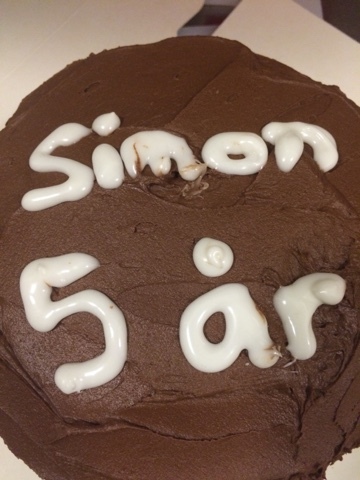 Then I had to go to Plan B, and just roll out a top layer of marzipan and then cover the cake in the chocolate icing. There were no good raspberries in my local supermarket (they were all mouldy), so I there was no real juzzing to be had either. I tried, though, I did try. 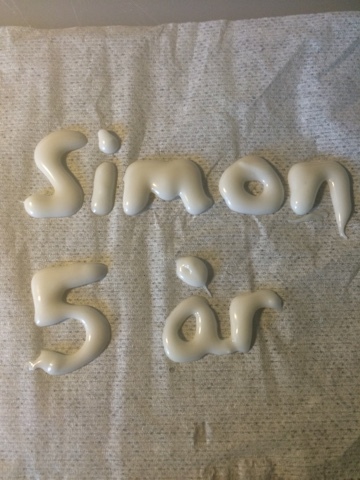 I tried to do stripy icing for the writing, and it disaster. Then I tried two tone sugar paste with blue and yellow, and it all melded together into a very pale green in the bag. Every day, there is so much to learn!